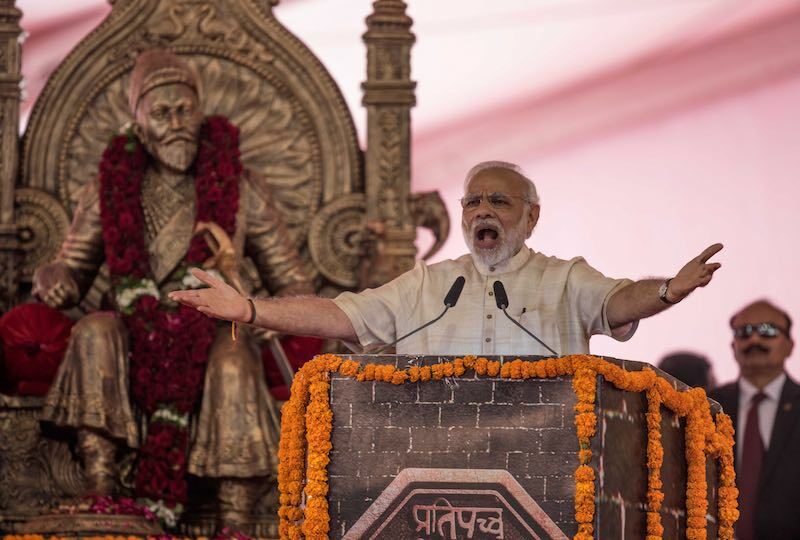 A statue to honour Chhatrapati Shivaji Maharaj, the Indian king crowned in 1674 and founder of the Maratha Empire, was first suggested in 2004. The driver then was a coalition of Congress and the Nationalist Congress Party, but it wasn’t until the Bharatiya Janata Party (BJP) government, led by the Prime Minister Narendra Modi, that the first ceremonial soil was poured at the site in December 2016. The statue is likely to be constructed atop an artificial island of rocks in the sea, around 1.5 kilometres off the coast of Mumbai. 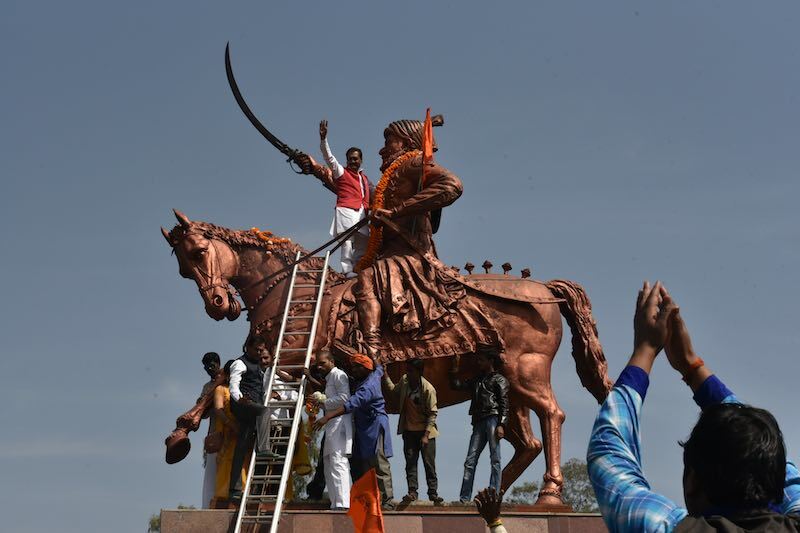 The planned equestrian statue is an integration of three structures – a horse on a pedestal, a Shivaji sculpture, and a sword, all together tickling the clouds at a height of 210 metres, which would make it the tallest statue in the world. The current tallest statue is the Spring Temple Buddha, in Henan, China, built in 202 at 153 metres. Several giant Japanese statues stand around the 100-metre mark, while the Statue of Liberty in New York and The Motherland calls in Volgograd, Russia, are each just over 90 metres. Rio de Janeiro’s famous “Christ the Redeemer” is a mere 39 metres by comparison, although it towers over the city from the peak of a 700-metre mountain. 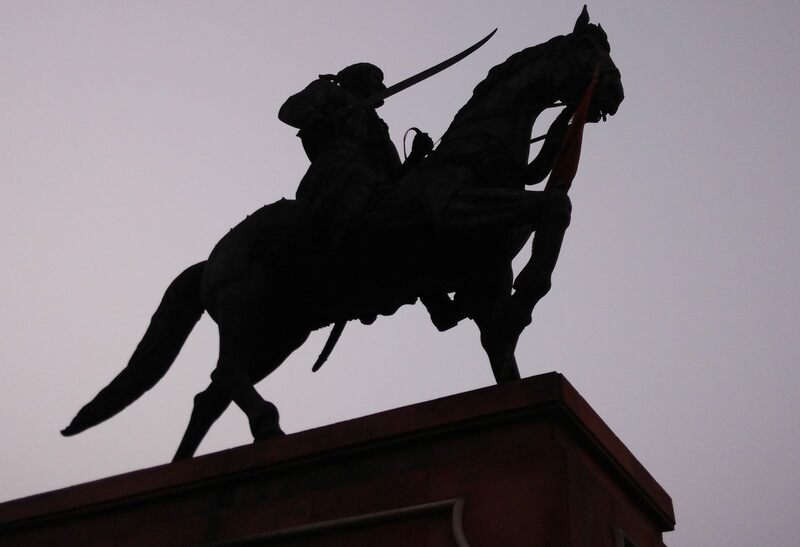 Despite a consensus in India among the political parties regarding the construction of what would doubtless be an iconic statue, the project has been delayed several times. The ambition to be the “tallest” has been one reason for delay. Media reports in 2008 suggested the Chinese government was making radical changes to the Buddha statue to increase its height to a towering 208 meters. This would have eclipsed the Shivaji statue, then designed at only 192 meters, and the news triggered widespread demands to raise the height. But the additional height also meant mounting costs. Proposals to scale back the ambition drew vehement protest from political opponents, so the government relented, raising the height to surpass the Chinese statue. Appealing to the sizeable Marathi population, about 31% population in the state of Maharashtra where Mumbai is the capital, also kept the ruling and opposition parties on the same page. Other obstacles remained. The series of adjustments to the project, coupled with concern the construction could cause permanent destruction to fish breeding grounds, depriving a livelihood for local Koli fishermen, slowed the plan. Finally, in June this year, the revised project received environmental clearance. Yet due to the delay, what was estimated eight years ago as a cost of US$36.4 million escalated to a whopping $557 million in 2018. The government said it could further tweak the cost down to $407.6 million without compromising the overall statue height, by reducing the sculpture of the king but extending the sword. Competitive bidding from several construction companies also saw the government select the cheapest bidder. But there are still concerns. The major problem is recouping the investment from tourism. The Taj Mahal, India’s most famous moment, draws in millions of dollars in revenue each year, but even should the Shivaji statue achieve the same benchmark, it will take decades to break even. Aside from the cost of construction, the expenditure for ongoing maintenance will be a vacuum on government revenue. Funding for the project will aggravate the already troubled debt situation of the state. Borrowings and liabilities for Maharashtra have more than doubled in recent years, and the financial situation is not improving. And then there is the disturbing condition of more than 400 historic forts in Maharashtra. Only a few of these forts are subject to official supervision, many are not mapped properly, and most don’t even have the basic facilities for tourism, such as toilets or drinking water. The Archaeological Survey of India, the organisation with expertise in conserving the nation’s forts, is handicapped due to a staff shortage, with reports earlier this year of around 2500 positions vacant across the country. In the budget of 2016-17, when the state government allocated $8.7 million for the conservation of Maharashtra’s forts, the funds could not be fully spent. Proper maintenance of these forts might have attracted tourists and increased the scope for the government to raise revenue. One conservation architect has even suggested the sites worthy of world heritage listing. When the upkeep of existing forts is doubtful, it is difficult to fathom why a new big-budget structure is the answer for India in the search for fortune.